summary/synopsis (from TLC website): In 1945, Elsie Schmidt was a naive teenager, as eager for her first sip of champagne as she was for her first kiss. She and her family have been protected from the worst of the terror and desperation overtaking her country by a high-ranking Nazi who wishes to marry her. So when an escaped Jewish boy arrives on Elsie’s doorstep in the dead of night on Christmas Eve, Elsie understands that opening the door would put all she loves in danger. uncomfortable truths of the past and seek out the courage to forgive. my thoughts/review: This is my first "favorite" read of the year. Great character development, picturesque historical descriptions, and skillful balancing of past and present are gracefully woven together like a cozy afghan that I wanted wrap myself in for extended periods of time. The tale of the Schmidt family during the time of Hitler...Elsie growing up more fortunate than most in that her family's bakery survived (all be it barely) through the Nazi occupation was thrilling. It made me yearn to know about my ancestors who, for all I know, may have experienced many of the same things. I can't begin to describe my feelings. It's "one of those". I find myself (oddly) at a loss for words. Other than to recommend it to fans of historical fiction and food. It ends with a wonderful little collection of recipes that span from 1940's Germany to present day Texas. I recommend baking up something tempting and spending some time along with your baked goods and this book. Put 2½ cups flour into a large bowl and make a well in the middle. Pour yeast, sugar, and 2 Tbs. of the warm water into the well and mix these together (don't mix in flour yet). Cover the bowl with a kitchen towel and set in a warm place until the yeast is foamy (proofed), 5-15 minutes. Add the rest of the warm water, oil, and salt. Using a wooden spoon, beat everything (including the flour this time) until well combined. Turn dough out onto a floured board and knead, adding as much of the remaining flour as needed to make a smooth, pliable dough. 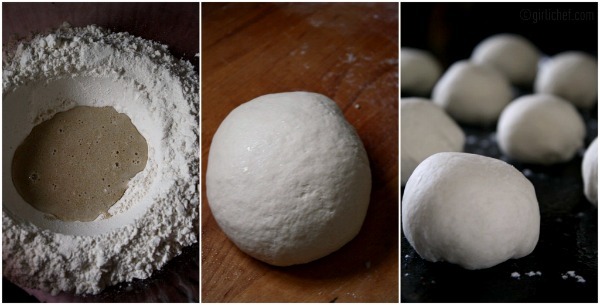 Place dough in a greased bowl. Cover and let rise at room temperature until it has doubled in size, ~1 hour. Punch down the dough and divide into 12 even pieces. Shape into rolls and place 3" apart on a greased and floured baking tray. Cover and let rise until doubled again, ~45 minutes. Preheat oven to 450° F during last 15 minutes of rise time. Cut a slit or a cross on top of each bun. Whisk egg and water together, then brush over the rolls. Slide into preheated oven and bake for 15-20 minutes until the tops are golden. Pull the warm bun in half. Place chocolate covered marshmallow in center and replace top. Squish together a bit and eat immediately. I used a Dark Chocolate Covered Marshmallow Heart on a still very warm bun...and it is PURE HEAVEN! about the author: Sarah McCoy is author of the novel, The Time It Snowed in Puerto Rico. She has taught English writing at Old Dominion University and at the University of Texas at El Paso. The daughter of an Army officer, her family was stationed in Germany during her childhood. She calls Virginia home but presently lives with her husband and dog, Gilbert, in El Paso, Texas. 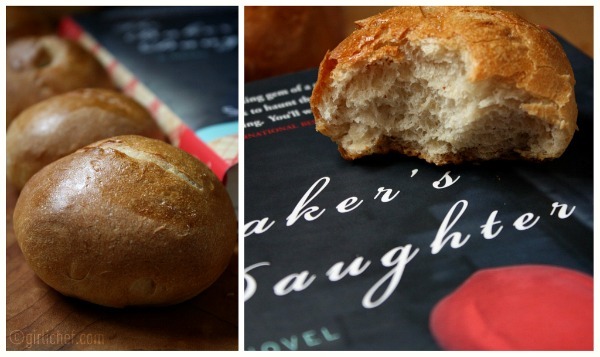 The Baker’s Daughter is her second novel. She is currently working on her next. A chocolate marshmallow INSIDE? Can it get any better? This book sounds very intriguing, I will have to check it out. And it's so true - bread really does mean so much to so many cultures. This sounds just wonderful. Thanks so much for the review. I want to read it soon. Good historical fiction AND recipes? What could be better?? 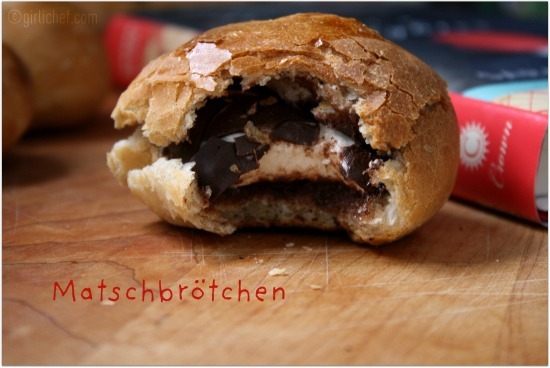 I love brotchen. We ate it everyday, at every meal, when I was in Germany. It is neat that it can be a dessert bread and also a ham/cheese bread or whatever. It goes with everything. This is pure heaven!! jajaja!! a mi familia les encantarán.. en la lista!! I don't know how you keep coming up with these amazing posts day after day. The top photo is exquisite. The review is so heartfelt, and the bread looks insanely good. Ok, you sold me on the book. I pinned it! Hopefully I can find it/buy it soon. The bread looks terrific. I'm especially into the version that is stuffed with the chocolate covered marshamallow. Umm you're a genius. That chocolate covered marshmallow inside a bun thing...doing that. And the buns are so pretty and round! I love the foam kiss surprise inside! Very cool. Reminds me of the chocolate-filled buns in Nice. I'm going to look for this book - I grew up in a neighborhood of Holocaust survivors and as sad as that was - there were amazing tales of selflessness and humanity. The bread is also similar to those had in local bakeries - just beautiful. I was hoping that you would bring the Brotchen today. Having spent some time in Germany, this brings back great memories for me. I must get this book, thank you for introducing it to me and bringing back wonderful memories! I need to make some Brotchen. Hope you have a fabulous week end and thank you so much for sharing with Full Plate Thursday. I'm so excited to get my hands on this book - it has all the things I most love: historical details, fascinating characters, an engaging story, and a WWII connection. I loved this book too. And the Matschbrotchen looks heavenly. I know what you mean about having the uncontrollable urge to bake after reading The Baker's Daughter. 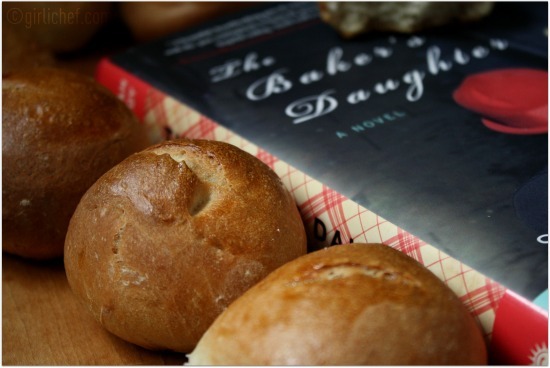 I like everything about The Baker's Daughter. (I wish I'd participated in the tour.) The story is the kind I love to read. Recipes included are a great bonus. Your sugary buns look yummy. I've heard so many good things about this book. Your review is wonderful and I loved the Mud Bread Rolls; they look yummy. This book has been on my radar for a while. Didn't realize recipes were included, too. Sounds like a must read! I thought the plain bread was fantastic, but then you put a chocolate marshmallow in and made it sinfully fantastic! The book sounds like a great read, adding it to my list. I love it and the name Mud bread rolls is so cute! interesting book...i think i'd like that, too. Matschbrötchen sounds (and looks) like heaven indeed!!! Looks like a wonderful book. Thanks for letting us know about it. Great synopsis...makes me want to go right out an buy a copy to read. Love the bread orbs and the photo with the marshmallow inside and bite taken out...perfect and mouthwatering.